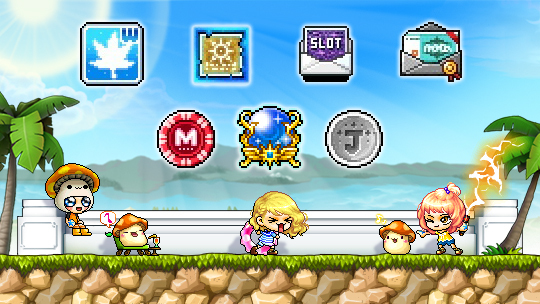 The MapleStory hot week is coming again! The event kicks off on Monday, March 27 and concludes on Sunday, April 2. Remember that this event is available to players Lv. 30 and above. As usual, logging in each day and click the gift box icon on the left side of the screen to receive a Gift Box, and then double-click the box in your inventory to open it. The Gift Box can be obtained once every day. • Storage Room 8 Slot Coupon: Untradeable, 7-day duration. • Miracle Circulator: Untradeable, 5-day duration. • Job Advancement Coin: Untradeable, 7-day duration. You can get not only Sunday's reward, but also another gift which selected from all of the items that were given out from Monday to Saturday on Sunday once you obtain a Gift Box every day from Monday to Saturday. It's time to get in-game for some great items during the whole week of Hot Days!